March 15, 2018 is the 65th World Contact Day. 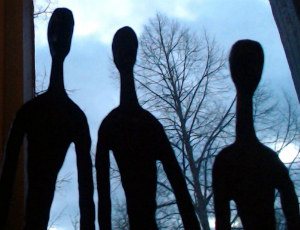 Begun in the 1950s in the golden age of UFO concerns, it's a strange annual event. Originally a group named the International Flying Saucer Bureau called upon people around the world to send a telepathic message of peace and welcome to alien observers of Earth. Mainly the event lives on in pop culture through the song "Calling Occupants of Interplanetary Craft" by Klaatu, covered gloriously by The Carpenters. Hearing the song recently got me thinking about how, at least at the movies, stories of human-alien contact tend to shake out along two lines: peace, understanding and friendship; or war, misunderstanding and enmity. Here I'll round up some famous examples of each. In this noble adaptation of famed scientist Carl Sagan's novel Contact, Jodie Foster plays a scientist on the SETI project who finds evidence of alien communication that may offer a way to make contact, but which human will be chosen to represent humanity? The conflict here is all between humans, not with aliens. There's no movie experience quite like Steven Spielberg's Close Encounters of the Third Kind, the story of a series of UFO encounters that culminates in a first meeting between humanity and alien life that is wondrous, with music being used as a universal language and lights displayed like fireworks. In the 1950s science fiction classic The Day the Earth Stood Still, an alien brings an urgent message of concern to humanity that we are on the path to self-destruction and to change our ways, but once again it seems we have more to fear from humanity than alien kind. In Spielberg's E.T., the Extra-terrestrial, a boy named Elliott encounters a strange little alien who was left behind on a mission and tries to help him go home. It seems E.T. has much more to fear from humanity than the other way around. Part Two: Was It Something We Said? The ultimate horror story about encountering something "other" than humanity in space, Alien and its sequels imagine a nightmarish first contact that happens to be with a species that is ugly, ferocious and highly malevolent. In the rowdy action film Independence Day, a huge hit in its day, Earth faces a massive hostile invasion from space and must rally its forces against seemingly impossible odds. It's overly dramatic yet corny fun, with Will Smith stealing the show as a daring pilot. Personally I never tire of Tim Burton's humble alien invasion parody Mars Attacks!. It came along six months later and ridiculed almost everything Independence Day took overly seriously (including special effects) and revels in a campy vibe of cheesy old 1950s Sci-Fi drive-in movies while also celebrating 1970s blaxploitation stars like Pam Grier and Jim Brown. Though not his most popular, it's worth noting that Spielberg himself took a turn at the alien invasion film with his adaptation of the classic H.G. Wells story War of the Worlds about a family struggling to survive a terrifying invasion from space. Considering the dated source material, it's better than it has any right to be. There are many more examples of friendly aliens, as well as plenty of horror in the tradition of Alien and movies that cook up supernatural enemies for superhero characters. For your viewing pleasure, also consider: Arrival, Invasion of the Body Snatchers, The Thing, Men in Black, Signs, Pacific Rim, Attack the Block, They Live and The Matrix (which both feature a "Wake up! They're among us!" message), District 9, Superman (the ultimate good alien), The Avengers and Transformers. Before you use your telepathic powers to welcome aliens to our world, you may wish to check out a few of these DVDs first.